This fast paced group ride leaves from Bollos on Wednesday (either 5:30 or 6 usually depending on daylight) and goes out Blacksburg rd or Tabor then returns on Blacksburg Rd. 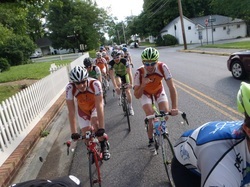 The group separates into an A and B group with the As chasing the Bs out to Sandy Ridge. This is an extremely fast ride and riders will be dropped. While the team is usually racing each weekend the community has lots of riders who post to the listserv (did you join yet) and set out at 10am from Bollos Saturday and Sunday using many of the routes listed on the "Routes Page". These will be described over the listserv but are usually moderate paced with stops. This is a no drop, mixed skill level ride. May split into different groups depending on attendance. Join us for a slow to moderate Monday ride for 1.5 to 2 hours of exploring beautiful rides! Meet at East Coasters Blacksburg!